The parents of Madeleine McCann said they had no plans to return home and would put their effort into running a pan-European campaign to find their 4-year-old daughter. Gerry McCann, Madeleine's father, said he and his wife Kate were "nowhere near ready" to return to England. They are still at the hotel in southern Portugal's Algarve region where Madeleine disappeared May 3. She vanishead after her parents left her and her brother and sister, both aged 2, alone in their room while they went to a tapas bar inside their hotel complex. Gerry McCann told reporters outside the hotel in Praia da Luz, about 200 kilometers (120 miles) south of Lisbon, that he did not know if Madeleine was still in Portugal. The family is concentrating on its Internet and media campaigns to publicize her disappearance across Europe, he said. He said in a statement broadcast live on Portuguese television that he and his wife were sure Madeleine would be returned safely. He encouraged people who had been on vacation recently in Praia da Luz to send their photographs of the town to police via a Web site in the hope that other people captured in the pictures could provide leads. Suspected sightings of Madeleine reported by the public are being collated by Interpol and forwarded to local police forces, he said. The McCanns may travel to other European countries to raise awareness about Madeleine's disappearance, he said. On Wednesday, the couple planned to visit the Roman Catholic shrine in Fatima, in central Portugal, to pray for Madeleine. 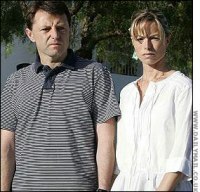 The McCanns declined to comment on the Portuguese police's only formal suspect in the case, 33-year-old Robert Murat, a British man who lives close to the McCanns' hotel. Police questioned Murat but later released him, saying they did not have enough evidence to bring charges.